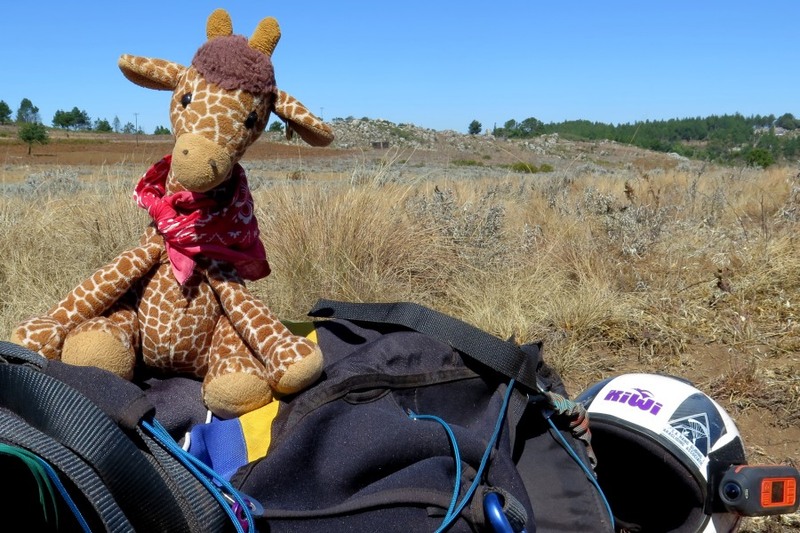 This is George; possibly the most well flown paragliding giraffe in the world. He’s been cold in the Owens Valley in California where he survived without oxygen at 4800m ASL and descended under a reserve parachute there too (without complaining or injury). He’s been hot in Porterville South Africa and didn’t need a drink even in +40ºC heat. He’s charmed his way through customs in the USA whilst I was failing to do so and got compliments in broken English on the takeoffs at Annecy, the paragliding Mecca, in France. The weekend of Africa Day he finally got his paragliding fix at World’s View, Nyanga, after a break of almost 2 years. It’s been a long time. The state of paragliding in Zimbabwe strongly reflects the state of the economy. Flat in a word. There were all of 2 of us pilots on the takeoff that weekend up at World’s View. In the heyday of paragliding there would have been at least half a dozen and we’d think nothing of leaving early on a Saturday, flying hopefully that afternoon and then on Sunday and driving back on Sunday night. Wouldn’t do that now; the fuel is too expensive and the roads far too dangerous to drive at night. The main road going east from Harare to Mutare and the Mozambique border is actually not too bad. I’m talking of the surface not what drives on it. Most of last year it was being resurfaced by a South African company (I know that because the traffic control at the various detours was far too organised for a Zimbabwean company). How it was paid for I have no idea as the government was only slightly less broke then than it is now. There was talk in the papers last week of lots of civil servants being retrenched. Actually the headline said “Fired” which implies there will be no retrenchment package. The road from Troutbeck Hotel up to World’s View was also being resurfaced when we were up there. No small deal that either as a LARGE and very new looking bulldozer was moving substantial quantities of boulders and earth and a grader was tidying up after it. Now I’ve been going up that road irregularly for the last 50 years that I can remember and it has never looked so grand! Almost 3 lanes in places. Again, who is paying for it? Nobody I’ve spoken to seems to know the answer which makes me a bit suspicious. This usually means a Fat Cat has told someone to get on with it as he (or she, but usually it’s a he) has designs on some property in the vicinity and wants easy access. Africa Day, for the ill informed, celebrates the formation of the African Union as one of the children on the landing field informed us. Our esteemed president, Robert Mugabe, is the current chairman of the AU. I’m not really sure what the AU actually does. Once upon a time the late Colonel Gaddafi proposed forming a United States of Africa. As delusional as it is grand i.e. very. The week of Africa Day there was a summit in South Africa which the rather odious president of Sudan, Omar al-Bashir attended. He is wanted to answer to charges of crimes against humanity by the International Criminal Court. Amnesty International wasted no time in filing for his arrest. The South African judiciary deliberated and deliberated and by the time a ruling announcing that the said president of Sudan could be arrested he’d been flown out of the country. How convenient for all involved. The judiciary upheld South Africa’s law abiding image and the AU got to give the finger to the West. I’ve had another trip to the Nyanga area a month ago. 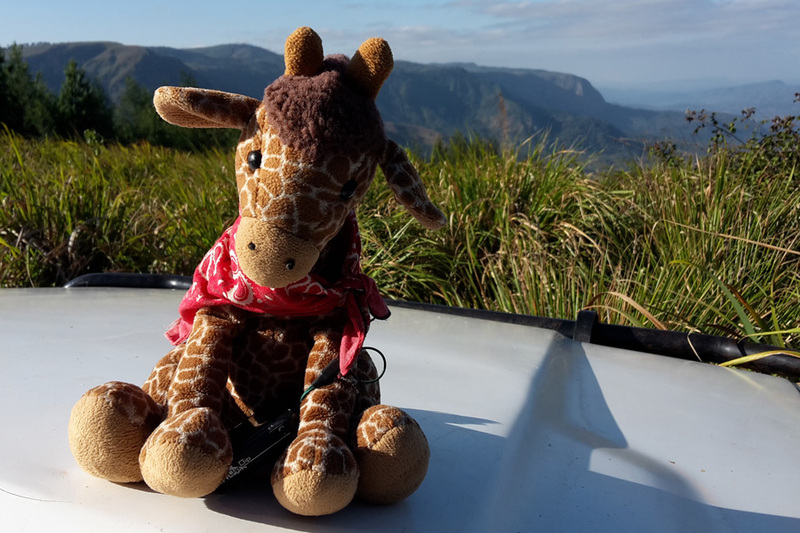 The top photo of George was taken at the edge of the Honde Valley where we once had a great takeoff. You might imagine that George is looking a bit glum as the takeoff behind him is submerged in over a meter of grass and is therefore not useable. This was where we used to be based for the annual Zimbabwe Paragliding Open competition. One year we had over 35 competitors. This year there were 3 of us. We did fly the following day from World’s View which was convenient given that we’d rented a cottage 500m away. It was not great flying by World’s View standards (usually it’s relatively easy to get 500m above takeoff) as it was heavily inverted and so we were limited to about 150m above takeoff. But it was hard work and good practice and George enjoyed it as you can see by the gilt in his eye.